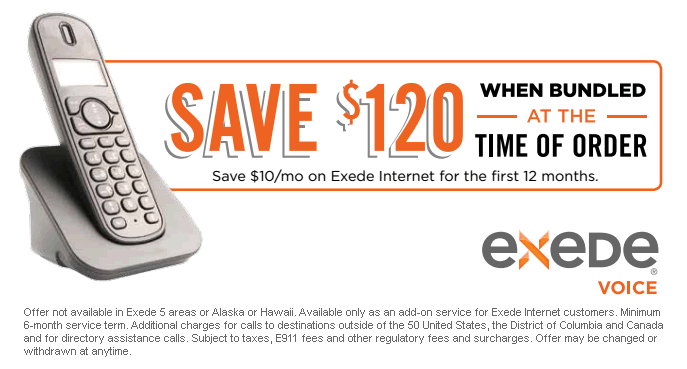 Get Exede Voice Home Phone Service and SAVE! Do you have great news you want to share with someone? So do we! Introducing Exede Voice home phone service which allows you to talk all you want with unlimited local and long distance phone calls in all 50 United States and Canada. Exede Voice is a voice over IP (VoIP) service which means you save money because can avoid all those extra fees you typically get with traditional phone companies. And there's no need to worry about using up all your monthly data allowance because Exede doesn't count your phone data usage against your monthly plan. Wow! And since the VoIP service is provided to you by Exede, your voice packets are prioritized to ensure you get great sound quality, unlike using a 3rd party VoIP service like Vonage which will use up your monthly Internet plan and may experience interruptions in voice transmission. Not with Exede Voice! Get voicemail, call waiting, caller ID, voicemails emailed to you, more!